i know you'll be here for me...the boat won't wait...the crates need sorting! I think you deserve the Creative Mother of the Year award. Fancy pulling such a gem from the packing cases. 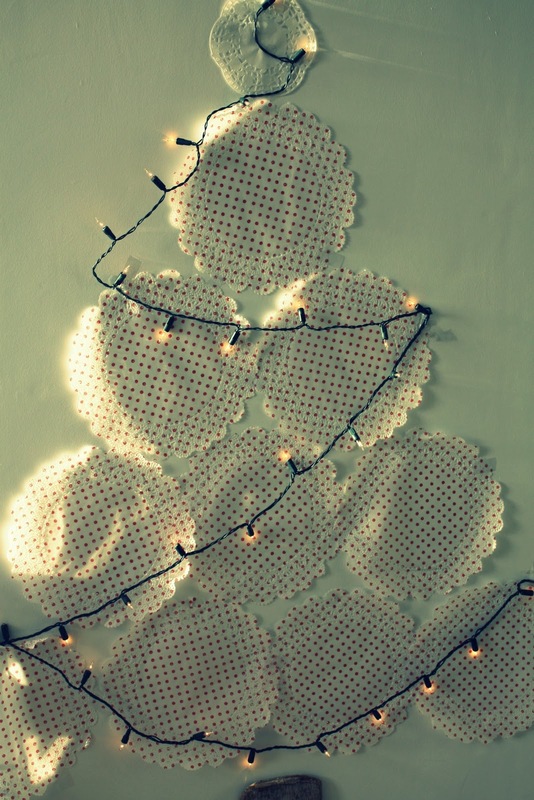 The tree is just so simple but effective. Your kiddos must think you are fab!!!! I am thinking of you lots...I hope your journey home is a wonderfully exciting one. And also very restful too. Will somehow miss you being in England with me- bizarre!! Wishing you much merriment with all the changes and know Santa will find you all! I'll leave the mince pies for you, and just have a handful of those pistachios! What a gorgeous tree. It must make your kids feel so happy and secure knowing that even with a bit of upheaval, Mum is still up to her old decorating tricks. 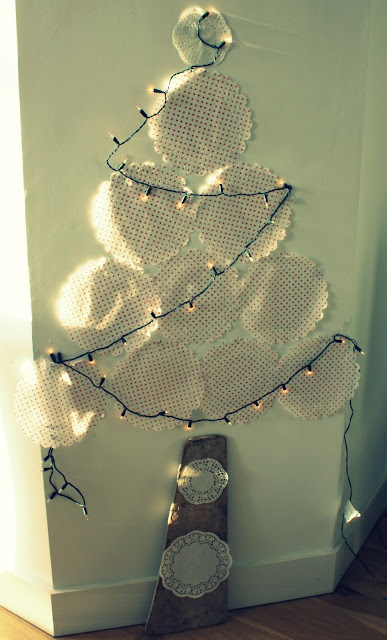 Oh my gosh that doilie tree is so adorable! 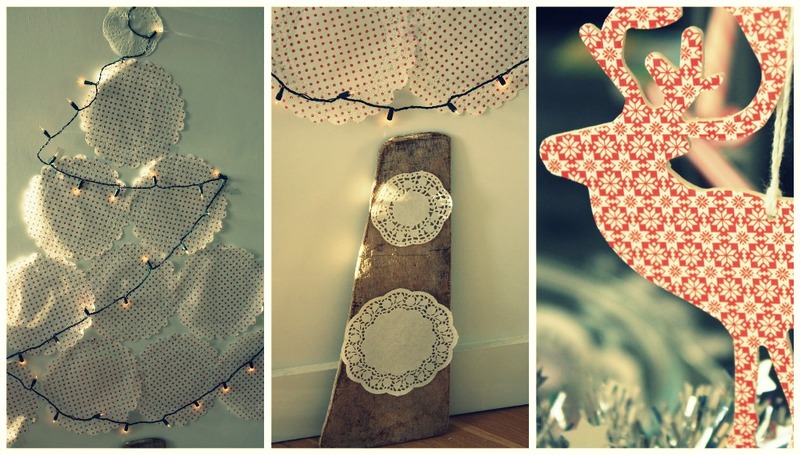 Where did you find polka dot doilies?? I love them! Your apartment sounds fabulous! Glad you are enjoying your last week before heading home! Can't to see you blog about Oz! P.S. What's in a mince pie?? Sounds like you are doing everything right in taking your move one day at a time. I can only imagine your journey. When my four children were young (between ages 9-3) we moved half way across country which took 4 days driving. It was an adventure and we also did not rush. Its such a good learning opportunity for them and it brought us even closer together. sweet melissa, i love your attitude. how do you stay upbeat? how in the &%$#@* world can you be blogging when you are moving your family across the globe next week?!? i am amazed and inspired by you, truly. so happy to have you in my life, even if it is in the "virtual" sense. i will be thinking and wishing the best for all of you in the next week... hang in there, friend!! Oh my, I LOVE her writing to Santa, so, so cute! (Zoe had a visit yesterday from him at her pre-school, afterwards she said that he wasn't the real santa, he was a Mister Santa....maybe she recognized a little of our next door neighbour in him....) Also, I had a little reminder project in mind for you, if you like it: take a picture of the sky in the UK on your last day and lay it next to the first day in OZ, great reminder of a transition photo to remember this moment in your life. You are doing such a terrific job managing this move and keeping all the important things like the tree and Santa reminder letters going. I completely understood that as I have also had to write a few of those myself when my girl was too little. Such precious memories. Keep at those mince pies and maybe a glass of sherry would be an idea too? You sure are a clever and creative little kitten. Nice work on the tree!! I can't believe your youngest is six, she looks so sweet and little. Love a mince pie, but I have resisted so far as I have been indulging in way too many glasses of bubbly and cheeses! You really are inspiring the way you juggle it all and always sound so positive and cruisy. Can I get me some of that? Ha! What a creative and resourceful Mama you are! Bit of magic in the middle of moving. Love it! 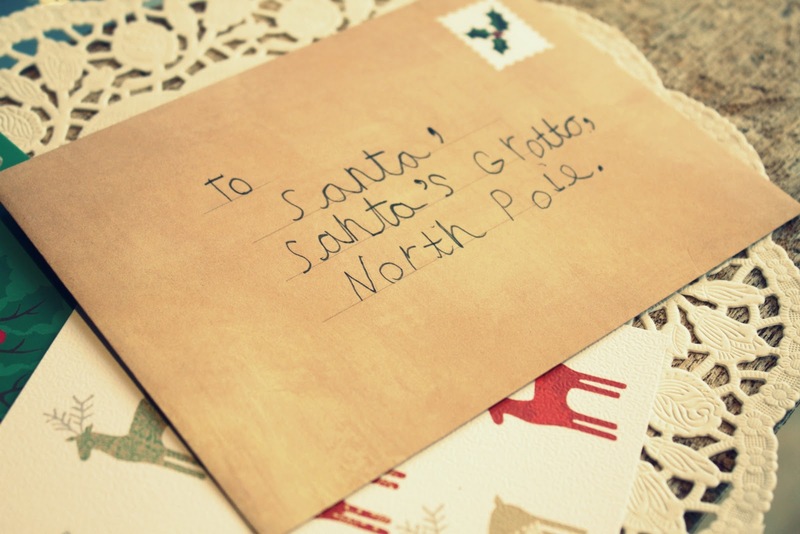 How gorgeous is that handwriting on Santa's letter too! Must sit down and do those tonight. In Oz the post office has an address for Santa and Santa replies to you. Last year the letter came back prior to Christmas and asked us to make sure we put sausages left over from the BBQ out for him instead of cookies as that was his favourite - the cheek! Of course we had to oblige! How wonderful to read about your move home to the beaches. Can't wait to read on and catch up on your news. All the best for the move. Emma.